In June 2010, Finnish dancer and choreographer Pirjo Yli-Maunula was one of the four dancers to travel up the Muonio and Torne Rivers in Finnish Lapland. 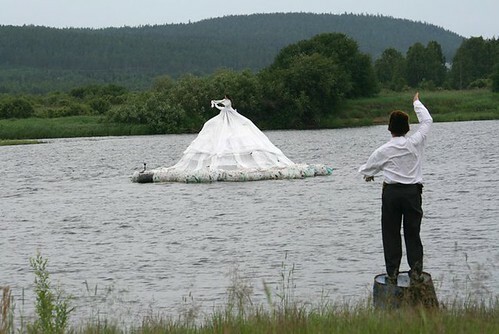 Their living and dancing installation River Woman was built on a ferry consisting of plastic bottles (about 25 000 plastic bottles were used to build a diameter of ten meters ferry, which operated a gliding dance-installation on a stage across the Muonio and Torne Rivers). Pirjo Yli-Maunula (being the main incubator of the project), dancer-choreographer Reijo Kela, and dancers Catherine and Anne Angeria were on a three-week river trip from Karesuvanto to Tornio performing to the audiences on the way. This dancing ferry is a kind of project that Pirjo Yli-Maunula would create, telling about how we are close to nature, and the nature is a stage for everything we do. Her performance projects – often taking place in the Northern Finland – have involved local audiences to participate and collaborate in mesmerizing ways. FI: What are you doing these days, you have quite a long career as an established choreographer and festival leader? Pirjo: I am busy with many things: I am working as a choreographer and a dancer, artistic director, curator and a producer. At the moment I am in the middle of creating a new duet with French choreographer-dancer William Petit. We are currently in Italy sharing a residency in Matera. We will have the premiere of ”Scars” in the beginning of November in Oulu in Northern Finland. Then, this year our company Flow Productions started to arrange a series of visiting contemporary circus performances in Oulu. I have been busy curating, producing and arranging this series. I am hoping that we can continue with the series next year as well. I just started to work again as the artistic director of Full Moon festival. I was in the job in 2004-2006. My current contract is for 2014-16. FI: You went to Cardiff couple of weeks ago, was this your first time in the festival? Pirjo: Yes, this was my first time in World Stage Design – festival. The week was intense, very interesting and great experience as a whole. FI: It seems that your international networking abilities are tremendous, you have been able to attract visitors to come to Finland, where did you learn these skills? Pirjo: I have learnt through the work itself. My different jobs have helpt me to build up the network. It is great to jump from the position of an artist to the position of a artistic director or funder or producer. Those different points of view help me to understand the bigger picture of the art world. FI: How multidisciplinary are you as an artist, what are your modes and styles of working? Pirjo: I am very much interested in working collaboratively with artists from different art forms. I have worked with artists in the fields of video, music, photography, new circus, theater, literature, games, new media, as well as costume, light and sound design. Every production and process is different: I have created not just contemporary dance pieces on stage but also dance-installations, site-specific works, dancevideo or works that could be considered as live art. I strive to create complete, meticulous works of art which nevertheless build upon improvisation and spur-of-the-moment insight. FI: What did you gain by attending WSD2013 in Cardiff? Pirjo: I was inspired by many things in the exhibition, meeting of other artists, and the overall exciting atmosphere of the festival. FI: Who are the people that influence you the most? Pirjo: I feel that the other artists that have worked with me have influenced me the most. As I am often also producing or co-producing my own work I am lucky to be able to build dream teams, where I can learn and get inspired by others. FI: Where do you see yourself in the future, what dreams do you hold within you? Pirjo: I would love to spend time in longer residencies and tour abroad more. I have quite an extensive repertoire that I believe would be interesting. For instance our multidisciplinary creation Susurro, that I also performed in Cardiff, would be a perfect piece to show for instance in Japan or South-Korea. I would like to tour in South American countries as well. FI: Name your most important collaborations, and why? Pirjo: I could talk about a number of different people and various different works. But if I would be allowed to mention just a couple I would definitely talk about French choreographer William Petit and Finnish light designer Jukka Huitila as I have worked with them so much. I have known William since 2004. 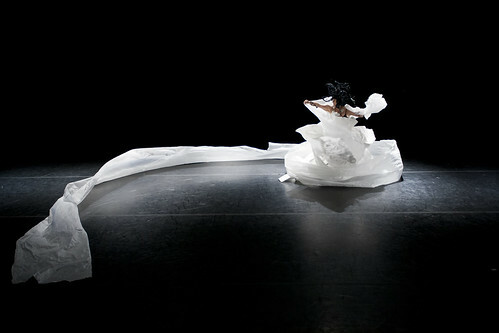 I have danced in his work and we have co-created pieces together. The intimacy, authenticity and bravery that we have found while dancing together has been very important to me. That has had an impact to my other work as well. The collaboration with Jukka Huitila has also been vitally important to me. His sensitivity, openness, generosity, intelligence and creativity are superb. His input seems to always deepen the work. The trust that we have in each other has helped me to grow as a person and as an artist. From the collaborative pieces that I have done I am maybe most happy about these two: Karsikko and Susurro. They have both been an adventure to something completely new as a form of art. FI: Last but not least, how does Finnish landscape help in creating your works, what would you like to say about our climate, the landscape, Northerness, Lapland and the nature? Pirjo: Many of my pieces reflect my relationship with the natural environment, as well as natural phenomena and seasons of the Northern landscape. For instance my work Karsikko (co-created with dancer-choreographer Titta Court) is based on a tree and animal characters, and it derives from nature´s materials and soundscapes.